WRGB aired a story on a very special reunion Wednesday at St. Peter’s Hospital. 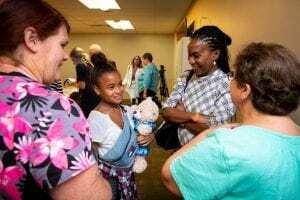 Thirteen-year-old Ella Koenig Belliard de Vaubicourt and her mother, Lindsay Shyllon de Vaubicourt, reunited with Kelly Maceachron, a NICU nurse who cared for Ella when she was born unexpectedly at St. Peter’s Hospital. Lindsay and her husband had been visiting friends in Kinderhook, on a visit from their home in Paris, France, when she went into premature labor.